The Fukushima Daiichi nuclear disaster may bring about a small revival to Japan’s robotics industry, which had long been losing ground with consumers as they worked on developing robots which could carry out duties which humans could already do, but now is working to develop new technologies for decontamination and recovery work in extremely hazardous environments where humans cannot work for long periods of time. The first robotic designs sent to Fukushima Daiichi were primarily equipped with special cameras which could resist the high radiation fields and radiation monitoring equipment to take measurements, but they all experienced difficulties and failed to provide workers with any meaningful information as to where the melted nuclear fuel may currently be located in the three crippled reactor buildings. The investigations are usually hampered by debris and obstacles which block the robots access to critical areas, sever communications, and overall bring the progress to a mind-numbing crawl. This has meant that much of the recent work inspecting the lower levels of the reactor buildings has been carried out by workers inserting cameras and monitoring equipment manually. 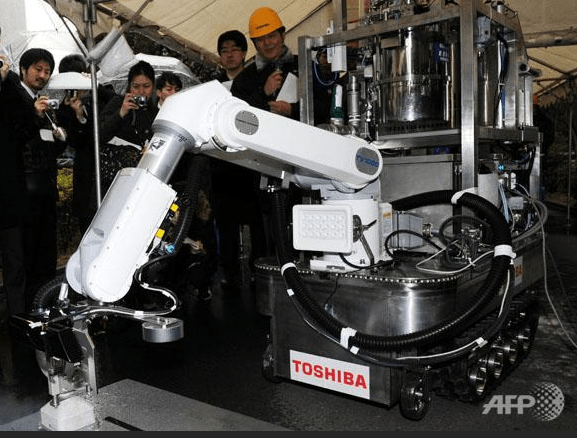 Toshiba’s latest model is essentially a remote controlled vacuum which uses dry ice to blast, evaporate, and remove radioactive materials. The robot will be sent to Fukushima Daiichi to decontaminate walls and floors, after being tested at a separate nuclear power plant later this month according to Tadasu Yotsuyanagi of Toshiba. The robot was originally designed to scrape paint off of airplanes, but this one has been specially equipped with robotic tracks and four cameras which allow operators to monitor the work being performed. It may be that TEPCO has decided that the best use of robotic technology at the present is to decontaminate areas strategically to allow workers better access to investigate first hand rather than relying on video feeds recorded by the robots. The latest design is not perfect as it can only clean an estimated 22 square feet per hour on optimal conditions but only holds enough dry ice for half an hour of operations at a time. This means that if it were to be used at the Fukushima Daiichi reactor buildings, either the robot must be extracted, or workers must be sent in to replenish the frozen C02 supply. Previously, Toshiba had developed a quadruped robot which froze up and toppled over during demonstrations for the press. When the robot was sent into the Fukushima Daiichi reactors it experienced another series of failures and toppled over while attempting to climb a staircase in the Unit 2 reactor building which houses high radiation fields that make it impossible for workers to enter many areas.